On June 12, 2018, Dieter Ungerboeck, the former Austrian Honorary Consul in St. Louis, Missouri, was awarded the "Grand Decoration in Gold for Services to the Republic of Austria" for over two decades as Honorary Consul by Christian Brunmayr, Deputy Chief of Mission at the Austrian Embassy in Washington, DC. Mr. Ungerboeck grew up in a small town outside Vienna. In 1967 he came to the U.S. and studied at Saint Louis University. In 1985, Dieter Ungerboeck founded Ungerboeck Software International (USI), a software development company that serves all sectors of the events industry throughout the world. He built this company from nothing into one of the world’s leading suppliers of software for event venues, like stadiums, concert halls, and convention centers. 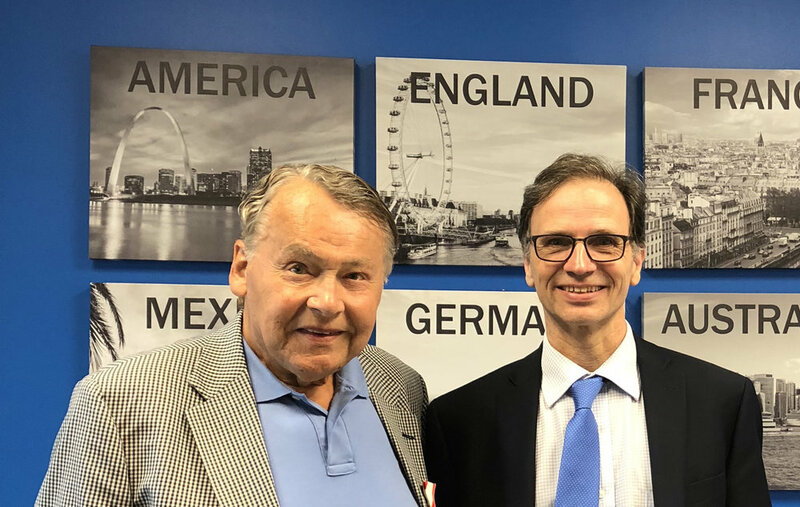 The ceremony was held in the presence of some 100 employees, as well as Mr. Ungerboeck's son Justin, the current Austrian Honorary Consul in St. Louis. #throwback to our article "Tradition of Scholarly Ambassadors of Austria in St. Louis"